Ask any high-schooler with rock-god aspirations on the brain and they’ll tell you that starting a band is much harder than just showing up in Mom’s basement with your friends and some instruments in tow (permitting you even have Mom’s O.K.). Like plowing a field of rock-strewn soil, starting a band is hard, dirty work. Farmers rely on heavy machinery to do the plowing for them, making the process both faster and more productive. Why then, if the proper machinery exists, isn’t it used in creating bands? Meet Encino resident John Mizenko, 48, whom some might call the Eli Whitney of garage bands. Mizenko doesn’t share his predecessor’s penchant for frilly ascots, but like Whitney’s cotton gin, Mizenko’s Van Nuys based program “Join the Band” is revolutionizing the business, helping musicians of all ages find the beat and find each other. 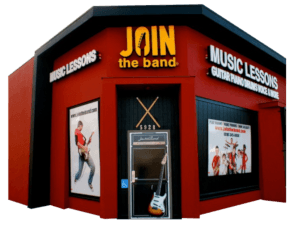 “Join the Band,” founded by Mizenko in 1998, is an eight-week program that groups musicians into bands of four or five, according to age and skill. Through weekly hour to hour-and-a-half practice sessions, led by Mizenko or one of his hand-picked teachers, the students learn to play three to five songs. Most transform from closet-rockers to full-fledged stars by the time the instruction sessions culminate in a performance at a local music club, most recently the “Knitting Factory” in Hollywood. The program has so far put more than 500 people in 637 bands, with many people coming back year after year. “What we offer is the ease of coming in, not having to set up instruments; they don’t have to worry about neighbors, they just have to show up,” says Mizenko. Bands are formed with a wide variety of musical styles, dictated by what the students are interested in playing. The most popular styles are rock, jazz, and funk, but Mizenko is always open to incorporating more styles to suit his student’s tastes. Still, as of yet, no one has asked for polka or Gregorian Monk Chanting. An all-ages program, “Join the Band” students average in age between nine and 69. For kids, it’s a chance to start a band without shirking too many homework responsibilities. For adults, “Join the Band,” provides a place to unleash their inner rocker without getting in the way of their careers – or getting on the nerves of their spouses. For Mizenko, “Join the Band” isn’t just about the music. Mizenko, a veritable guitar virtuoso with 35 years’ experience, is originally from Aurora, Ohio, where his axe-manship and innate sangfroid secured him a spot as his high school’s rock star. Much to his less ambitious band-mate’s dismay, he moved away after graduation to Boston to attend the Berklee School of Music. After earning his B.A. in Professional Music is 1981, Mizenko heeded the Sunset Strip’s call and moved west to L.A., where he has lived for 20 years. With the possibility of opening a “Join the Band” location in Calabasas, the proposed installation of a recording studio in his Van Nuys location, and more and more students and bands every session – along with a two-year-old son at home whom sources say is interested in becoming a drummer – Mizenko’s scarce free time is a testament to his dedication to all things music. 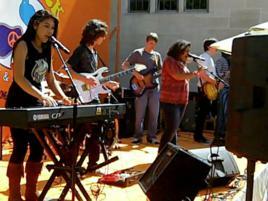 See “Join the Band” students perform at the Knitting Factory, Hollywood on Dec. 10th starting at 11 a.m. Visit jointheband.com or call (818) 345-8950.